Preheat the oven to 180°C/gas mark 4. Whisk together all the ingredients for the vinaigrette. Season with a little black pepper and set aside. The flavour will intensify if it sits for about 15 minutes. Lightly oil the fish, then season each fillet with the lemon juice and freshly ground black pepper. Lightly oil a large sheet of foil. Lay the fish in a row and tuck a sprig of rosemary under each fillet. Add a little more lemon juice and wrap into a large baggy parcel. Bake in the oven for 20-25 minutes. Meanwhile, prepare the leeks. Trim their tops and bottoms and remove any tough outer layers. To clean them, slice in half vertically from the green end downwards, stopping one third of the way down, so the green part of the leek splays out. Rinse thoroughly in lots of cold water. This will also allow you to arrange the leeks prettily on the plate. Drop into a pan of boiling water and cook for 3 minutes or until tender. Then, if grilling, cool the leeks under the cold tap and pat dry with kitchen paper. Preheat an oven-top grill pan over a medium-low heat, or preheat the grill. Rub the leeks with a little oil and season lightly. Grill, turning regularly, until the leeks are flecked golden. 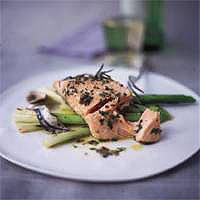 Remove the salmon from its foil wrapping and arrange on plates with the leeks. Spoon over the parsley-anchovy vinaigrette and serve.